Surprise your loved ones by sending this Exclusive Winnie The Pooh Designed Stationery Set and make them happy. 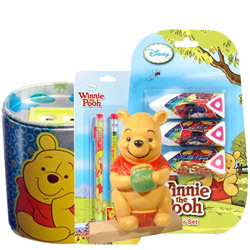 This Stationery Set is displayed with attractive Winnie The Pooh Designed Pencil Set, Sharpener, Three Triangle Shaped Eraser Set and One Coin Bank. This Set is very useful for School Going Kids, as its features include bright Refreshing Color, Easy to Carry and made of Good Quality Fiber to ensure Longer Usability and Easier to Use. Flowers Delivery Bhillai, Send sweets Thirualla, Wedding Cake Lucknow, Diwali Mithai Bhiwadi, Send Flowers and Gifts to Tirunlveli, Online Shop Jhansi, Flower to Sirohi, New Year Flowers Belapur , Fresh Fruits Navsari, Send Gift Bhubaneshwar, Dry Fruits to Hapur, Birthday Delivery Solapur, Sending to Bharatpur, Flower shop Pallakad, Adilabad Online Cake Delivery.